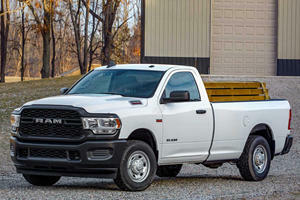 The RAM 3500 is a workhorse, or a team of workhorses in one package. It’s the most serious in the truck lineup and is best suited for hard work and a hard life, mainly because it’s built to take a beating. You can get one for as little as $33,000 and if you take one with the biggest cab, biggest load bin and longest dually wheelbase then $80,000 will net you little change. 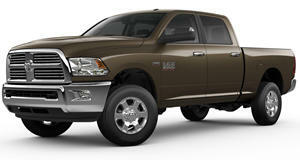 The RAM 3500 not only has the biggest possible payload out there, but it has a leading 5-year / 100 000 mile warranty. If you’re getting a truck for any other reason besides hauling loads and building an empire, look elsewhere. If for some reason the RAM 1500 and the RAM 2500 trucks end up being too small for your needs, the last one in the range will surely tick all the right boxes. The oversized truck is available in 6 trims with a host of configurations and starts off at just over $33,000 for the entry-level Tradesman, but that doesn’t mean its lacking in any way. In true US style you can upsize things a lot, there are various cabin sizes, load bin sizes and also different overall lengths – you’re basically just limited by budget. With the 3500 being destined for heavy-duty work, things inside are a bit harder and stronger so that they’re durable, but with the layout and design it still looks good. To break the robust theme a little there are some luxury finishes available, but these are dependent on the model chosen as some options are only available with certain trims. There’s very good space in all models, and if you take the bigger cab option you can fit 6 in comfortably. There’s plenty storage space inside too, you could actually put something safely away not find it for months. Chrome and wood finishings as well as leather seating can be had too along with different kinds of carpeting; you can easily spend upwards of $15,000 on options. With power adjustable seating you can get yourself into a comfortable position, and the on board driver aids help to move the truck around, but this isn’t for novices. The bigger and heavier a truck, the more disconnected it will feel, that’s simple physics. You have to keep in mind the width and length in all situations so you don’t accidentally direct the dually rear end over a Prius, but you’d definitely know if you did that thanks to the very stiff rear suspension. It has to be uncomfortably stiff to be able to carry the large payloads the truck is designed to carry though, so it’s unavoidable. With over four tons to the RAM 3500, braking distances need to be considered too, especially when the rear is loaded or towing but a great addition is the Cummins Smart Diesel Exhaust Brake System when the diesel engine is optioned. There are driver aids in the form of park distance systems that are a must in a vehicle of this size, and a great addition is a cargo-view camera to keep tabs on your payload. When you get over the sheer bulk of things, you can be at home in the cabin, but a daily driver the RAM 3500 is not. The RAM 3500 can be had with a 5.7-liter V8 HEMI with 383 hp and 400 lb-ft of torque, but as good as those specs are, it may feel underwhelming in this scenario. There’s also a 6.4-liter V8 HEMI with 410 hp and 429 lb-ft of torque that’s better, but if you want to haul as much as possible or have bragging rights, then the Cummins diesel option is a must. The big 6.7-liter turbo diesel churns out a healthy 385 hp with a massive 865 lb-ft of torque, and this can tow a maximum of 31,210 pounds. Basically if you want to move house you can simply hook it up to a RAM 3500 and point the truck in the direction you want to go. It is a $9,200 option though. Four different 6-speed automatic transmissions are available and they rise in price as different things are added like oil coolers. 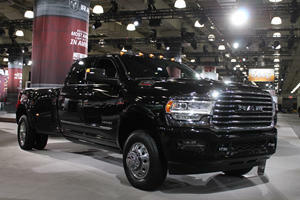 With the RAM 3500 being aimed at the work force, there are some features that are needed and worthwhile. The RamBox cargo management system offers lockable storage, operated via the central locking. For the biggest loads, there’s helpful options like the heavy-duty hooks, an available tow/haul mode feature that includes a more aggressive downshift schedule, self-leveling suspension and even a snow plow if the need arises. On the safety side the RAM 3500 is much the same as the other RAM trucks with an array of airbags, some electronic driver aids and the added bonus of a strengthened chassis. 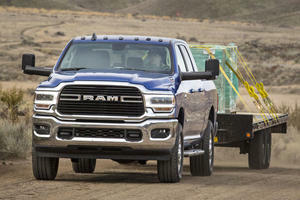 The RAM 3500 is a workhorse, or a team of workhorses in one package. It’s the most serious in the truck lineup and is best suited for work and a hard life, mainly because it’s built to take a beating. The engine options are good, and even though the Cummins diesel option is over $9,000, it’s probably the best one to get. While you can make it quite comfortable in the cabin, it’s not going be as good as any of the smaller Ram trucks but it’s still a good place to operate a business from if you need a large, rolling office.